Shakespeare wrote that a rose by any other name would smell as sweet — but what about when it is being devoured by aphids? Rebekah Grimes examines aphids on a milkweed plant at the Claytor Nature Study Center this summer. 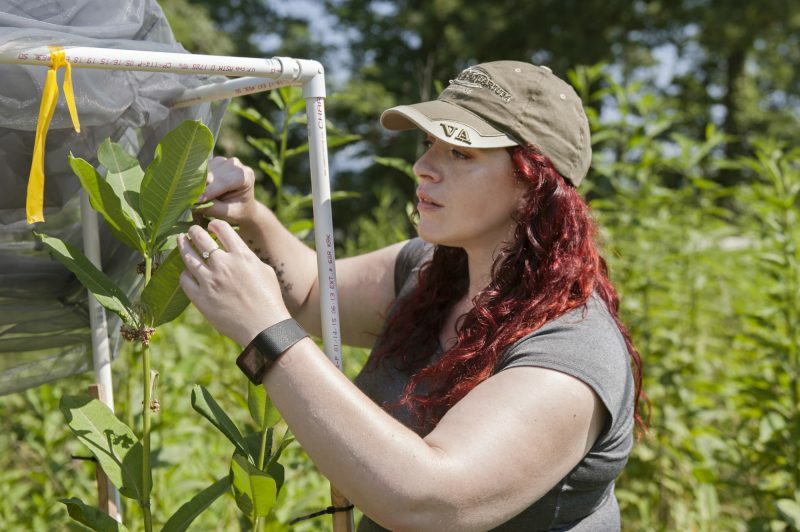 University of Lynchburg student Rebekah Grimes is conducting research to determine whether parasites impact a plant’s ability to attract pollinators through the aromas they release. Over the summer, she spent a lot of time at LC’s Claytor Nature Study Center to study plants and pollinators. 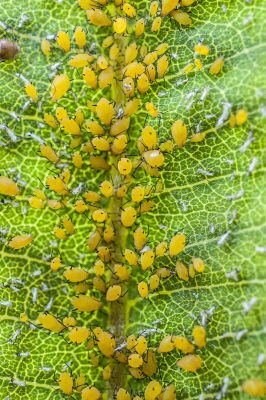 Aphids are insects that feed off of the juices in a plant. “They’re the bane of a rose garden’s existence,” Rebekah said. Flowers and other plants do not take kindly to the aphids’ presence, said Dr. Jennifer Styrsky, an environmental science professor at LC. “As aphids feed on the plant, they induce a defensive response,” she said. That defensive response includes chemical changes. Wondering whether those chemical changes might alter the plant’s scent — and, therefore, the ability to attract pollinators — she and her husband, biology professor Dr. John Styrsky, suggested that Rebekah explore that question through summer research. Aphids on a milkweed leaf at the Claytor Center. “I thought it would be challenging and the most interesting,” Rebekah said. “I really enjoyed the project’s merging of chemistry, biology, and ecology.” As a graduate of Central Virginia Community College who chose to continue her education at Lynchburg in preparation for medical school, Rebekah was eager to try her hand at real-world research. They focused their study on common milkweed (Asclepias syriaca), another plant that aphids enjoy as food source and which is easily found at the Claytor Center. During their regular trips to collect data, Rebekah counted the aphids on plants and noted the frequency and duration of pollinator visits. She also used a device to measure the chemical compounds that the milkweed released into the air. The project could have implications beyond milkweed, she said. In fact, it could harm monarch butterflies, which use milkweed as a host plant. “If these aphids are somehow having a negative impact on these plants, that could be a potential problem for not just the plant itself, but also for monarch butterflies,” Dr. Styrsky said. Rebekah’s research was supported by a Summer Undergraduate Science Research Fellowship from the Virginia Foundation for Independent Colleges and Carilion Clinic. Additional funding for the project was provided by a Percy Wootton Student-Faculty Research Award from University of Lynchburg.